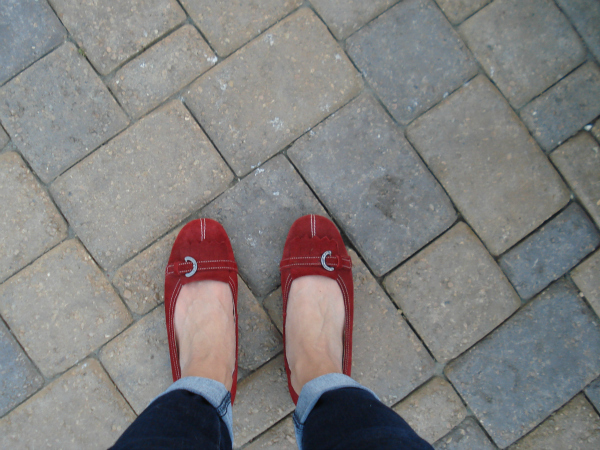 I finally got to wear my red German shoes that I bought back in December. I have lived in boots since December (as evidenced by my not-Pacific-Islander-tan-looking skin below), but the weekend warmed up, and I finally took my red kicks out for a spin. I love them! Now I need a tan. 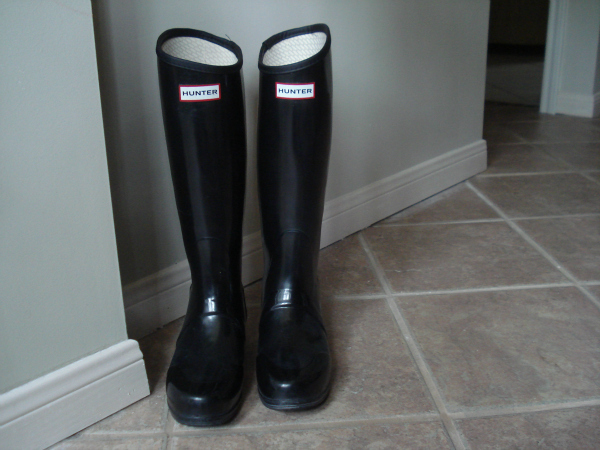 I also gave Meg's Hunter wellies a new home. The ten-day weather forecast says that I might put them to good use as early as this weekend, but I'll keep my excitement at bay since we all know how reliable the weather report is, especially more than 24 hours out. My brain and eyes are longing for the weekend! My second term of grad school is coming to a close, and my new classes begin next Monday. But before Monday rolls around, I just want to enjoy my weekend. Sleep, QT with Sir Husband and the kitties, lunch with Whitney, make sweet potato chips, watch a good movie at home, sleep some more, and ride my bike. And if I have a reason to wear my new wellies, even better! But before all that, it's time to conquer Thursday! Over and out. Umm super cute shoes. And trust me, I got the whole winter pale skin going on over here. I wish there was a healthy cure for that! Those red shoes are adorable. And congrats on finishing your 2nd semester of grad school! Cant have a bad day in a pair of RED SHOES!!!! You are such a positive person. Life is good! Simple and good! That's what this post reminds me of. If it makes you feel any better, you look more German in the shoes without the tan...and I'm jealous of the fact that you can wear them. It snowed here last night and is calling for snow again tomorrow. I'm so ready for spring. Germany hasn't gotten the message yet. Can't wait to see you in a few hours! And I am jealous of ya'll lunch date! We all need to get together soon! :) I miss you both mucho! Good luck with the beg. of your new semester!!! !